Portable vehicle barriers manufactured by Meridian Defense are modular and are adjusted to the varying needs of the military, government, ports, dams, water treatment facilities, oil & gas facilities, universities and the police, special events and public venues. All Archer vehicle barriers made of ballistic rated steel and are an excellent deterrent against Vehicle Born Improvised Explosive Devices (VBIED). Meridian’s portable vehicle barriers can be deployed by one person without the use of heavy lifting equipment. Meridian offers a vehicle barrier rental program for special events. All of Meridian’s products are made in the USA and are distributed world-wide. 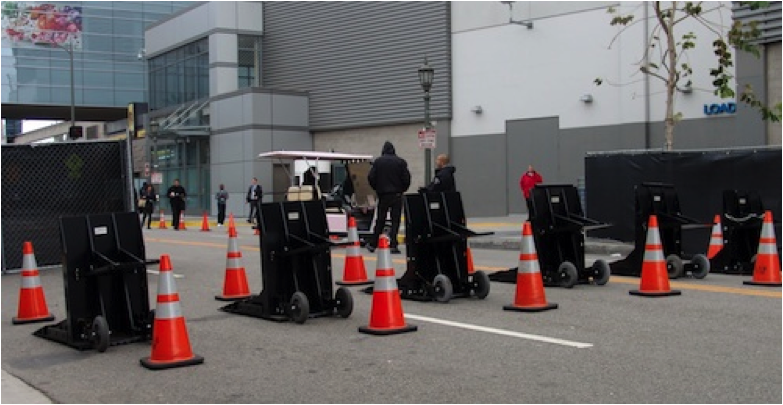 Meridian deployed the company’s patented Archer 1200 vehicle barriers to protect the 55th Grammy Awards. Meridian’s rapid deployment barriers barricaded four lanes at a key entrance at the Staples Center. The Archer 1200 barriers effectively blocked vehicular traffic while granting pedestrians unimpeded access. The Archer 1200 vehicle barriers are configured for expedited deployment and as needed, retrieval and relocation. The rapid deployment vehicle barriers are transported on a trailer and can be rolled into position by one person without the need for heavy lifting equipment. The Archer barriers blocked 44 ft. from vehicular intrusion and took approximately ten minutes to deploy. 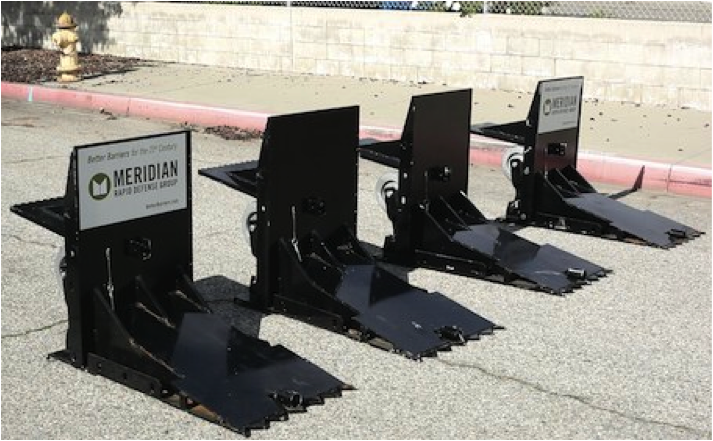 Meridian’s portable vehicle barriers are modular and are adjusted to the varying needs of the military, government, ports, dams, water treatment facilities, oil & gas facilities, construction industry, universities and the police. All Archer vehicle barriers are made of ballistic rated steel and are an excellent deterrent against Vehicle Born Improvised Explosive Devices (VBIED). Meridian Rapid Defense Group was awarded a contract and delivered their patented Archer 1200 rapid deployment vehicle barriers to Kandahar Airfield. Kandahar Airfield has been maintained by NATO under the International Security Assistance (ISAF) banner since 2006 and is a key logistics hub used by NATO forces in Afghanistan. It is now one of the busiest single-use airports in the world. The Archer 1200 anti-ram vehicle barriers are configured for expedited deployment and as needed, retrieval and relocation. The Archer barriers are modular and can be deployed in a straight line, in rows, in serpentine configuration as a main perimeter security system or in support of an area that requires maintenance. Contact Us for our different barrier systems and costs.